We have been in Georgetown a week and a half and have been in four different anchorages: Kidd Cove, Monument, Palm Bay and yesterday we moved to Black Rock Point, between the more crowded Volleyball Beach and Sand Dollar Beach. The photo above was our anchorage in Palm Bay across the harbor from Monument. We moved there for weather but mostly because Daisy had a vet appointment in Palm Bay on Friday. It was just us and Interlude for awhile in the anchorage and in the late afternoon three other boats we knew came to join us: Cookie Monster, Two of a Kind and Cool Cat. There are three small resorts with restaurants and cottages on shore. 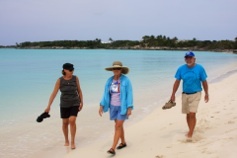 Going ashore and across a private road there is a very quiet calm anchorage called Goat Cay. It is extremely calm except with winds from the north but is a seldom used anchorage because it has a shallow entrance. We walked on the beach and across the main road to the NAPA store which is like a small Lowes, very well stocked. We were glad to see Dr. Deane again and discovered that Daisy’s other ear was slightly infected. I guess we had been ignoring it, working on the infected ear. So, more medication and more dollars, but we were glad to support Dr. Deane who comes here from Florida two days a month. That night we had drinks during Happy Hour in one restaurant on the water and then moved to the Palm Bay restaurant for dinner. The other three boats left in the morning and it was just the two of us again. 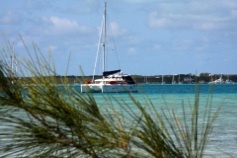 Palm Bay is a very quiet protected anchorage that few boats use, probably because it is a long dinghy ride to town. Some cruisers belittle Georgetown because they think it is so crowded but we always find a quiet place to anchor and still have access to the great facilities ashore. The photo at the left is our anchorage today in Black Rock Point, all by ourselves close to shore with other boats in the far distance. 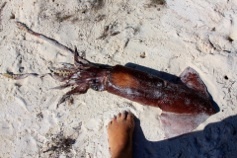 Today Mark found a HUGE dead squid on the beach by us while he was walking Daisy. 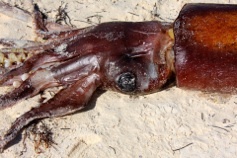 (See Mark’s foot in the picture at the left and its head at the right.) Crossing over from Palm Bay yesterday we passed over many large starfish on the bottom and a big manta ray. Occasionally there are dolphins in the harbor and there are a number of coral areas to snorkel with fish and other sea life. Daisy spends about two hours on deserted beaches each day. The photo at the left is her current walking grounds. Notice she has a new haircut. 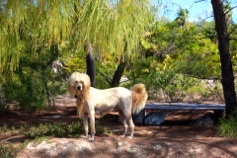 With her big head of hair and mane, she looks like a lion. Mark prides himself in her “unique” look. 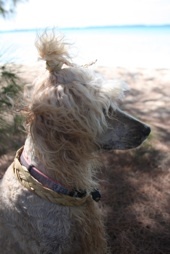 Today on the beach he found a braided tie and gave her a ponytail. Also, if you look closely at the photo on the right, you’ll notice her “island girl” braided necklace. Mark made that for her out of palm fronds. Dr. Deane told us to cut her mustache because she had a yeast infection on her lip. Today we went to Volleyball Beach to listen to a talk about Bahamian culture and history by a local gentleman named Cordell Thompson. 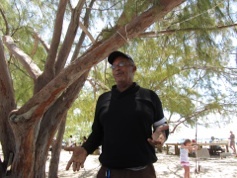 His title is “Exuma Historian and Director of the Pompey Center for Studies in Traditional Art, Music, Food, and the Unresolved Mysteries.” (Pompey was a slave who started the revolution that led to the freeing of Bahamian slaves.) His very entertaining talk lasted several hours. 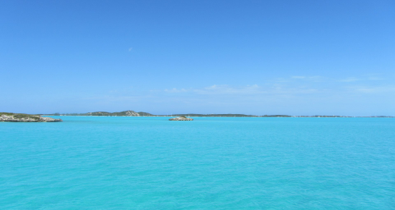 American history has been intertwined with the Bahamas from the Loyalists who populated it after the Revolutionary War to Bahamians who came to work in the States during wars. Rum runners from the Bahamas made a lot of money during US prohibition bringing liquor to the States in their boats. Many Bahamians leave their country to go to college in the US, Canada and England. They get scholarships from the Bahamian government, but have to return to the islands for four years to work here. The scholarships are rewarded to students who study needed professions, such as doctors and teachers. Most choose to stay for the remainder of their lives. Mr. Thompson spoke about marriage customs, food, bush medicine, occupations, boat building and much more. We sat at a picnic table with a group of about 30 cruisers with our bare feet in the sand, entertained by his stories. He has been sharing tales of the Bahamas every Sunday for the last month or more and will continue to do so until the end of April. This is the first time we have been to hear him but will certainly go again if we are still here next Sunday. If you Google his name, you’ll learn much more about this fascinating man. He reminded us of the Saunders brothers we met in Bimini who were also talented, educated and very successful yet humble. Some people who haven’t been here think of the Bahamas as a third world country where no one is educated and the people live in squalor. The Bahamians have very close ties with the US and they are some of the most friendly, honest, relaxed people you will ever meet.